Have you heard about the Miranda Lambert third single rule? It goes like this. The first single will be alright, the second will be better, but you won’t get a great one until the third time around. Yeah, it took until the fourth single the last time around. 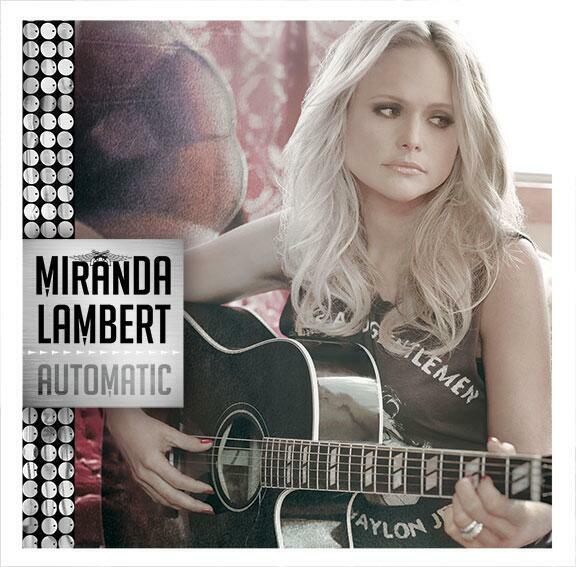 Still, I’m optimistic that like so many times before, lead single “Automatic” won’t be the best thing waiting on an upcoming Miranda Lambert album. The song starts off promising, with a lovely personal memory about taping songs off the radio because you couldn’t afford to buy them yet. But the argument that other technological advances have made us less appreciative and more emotionally hollow doesn’t ring true. Paying at the pump is better than waiting in line. GPS beats Rand McAnally. Cell phones are better than pay phones. And anyone who is reminiscing about manually rolling down car windows wouldn’t be so sentimental if we took their power windows away. I’m all for nostalgia when done right, but even when it’s great, like on Tim McGraw’s “Back When”, the focus isn’t so much on yesterday’s technology as it is on yesterday’s time spent together with others. What “Automatic” misses is that it’s not about technology; it’s about time. Everybody reaches an age where they wonder where the time went, that it seemed we had so much more time when we were younger. Truth is, the adults were just as busy back then. We just didn’t notice it because we had all of the time in the world. You hit right on the head my chief frustrating issue with this song, Kevin. I admire that Lambert selected a song that tacks an issue that hasn’t been covered often as of late on country radio: not taking for granted all of the hard work that drives innovation and warning of the vices of instant gratification. It’s a worthy topic to tackle, and I also think the sticking point (“When everything is handed to you, it’s all only worth as much as the time you put in…”) is compelling and poignant. But here’s my big issue with “Automatic”. The generality of the argument posited by this song’s three co-writers is off-putting in that it lacks nuance. I, myself, understand the sentiment in taking all that we have earned and strived for, for granted, as well as the reality that many people DO take marriage lightly or don’t have to sit and write a handwritten letter anymore as opposed to sending a Tweet these days. It is understandably frustrating to an extent. For the purpose of comparative analysis, I’d like to size this up to Dierks Bentley’s “I Hold On” for perspective. The reason why “I Hold On” wins me over and is one of my favorite releases on the current chart is because Bentley and his co-writer so effectively and convincingly point out how time only adds to the value of the things that matter most. In addition, the emotional heart in which Bentley sells the lyrics and his own personal vein effortlessly persuades us that it is all coming from some place real, and also is a testament to Bentley as a character and individual who truly cherishes all the things he believes in. And what’s up with incorporating divorce in all of this? Or making the insinuation that the proper way to work out relationships on the rocks is just as simple and/or mechanical as shifting gears and rolling the windows down? In the end, “Automatic” is a rather compelling idea for a song that is nonetheless sabotaged by a nagging attitude and judgmental streak. I concur with the C grade. I like this one. Point taken on all of the above, but I think that the more people that hear that line “When everything is handed to you, it’s only worth the time you put in”, the better. P.S. I also disagree on the “third single rule”, but since I’m probably the only person in the world that doesn’t like “The House That Built Me”, it’s probably not worth getting into. Luv Miranda’s new song! A song w/ a message – what a concept. She lives in a small town and she must see the differences from fast paced LA and Nash constantly. Don’t know why ya gotta hate. Also WRONG about the singles I liked that her singles aren’t so obvious “radio cuts” , that is called artistry. PS the song is her story. Her parents got married young had problems got divorced and then they worked out their issues and got remarried very quickly. Taking your time and not looking for the quick fix is the issue, seems like many are trying to put too much in the lyrics. I find it funny when people make up stories about these lyrics. Judgmental really? She talks about slowing down to live in the moment. She says she has to remind herself that things take time and not want things done as fast as possible but the work will be worth it down the road. It is a catchy song and has a good message so of course people put it down- no back roads, beer, whiskey, talking about girls, etc. Liked the song, it should be higher reviewed especially since so many puff crappy songs have been given higher grades! Firstly, the point is, why bother bringing up the topic of marriage in the first place, in a song in which the lyrical imagery is predominantly made up of technological innovations? Just do something Five For Fighting accomplished better with the single “Slice”: which concerns how technology has resulted in the decline of social capital and ha compartmentalized life to the point, instead of living and breathing collectively, we’re all divided like slices of American pie. I stand by my initial interpretation of this release based on lyrical scansion. You call it making “up stories about these lyrics”, I call it drawing an alternate conclusion. There are both a minority of songs in which do cater to that frat-country constituency in which are executed quite well, and then there are songs that lyrically venture off that topical path that may have interesting ideas but are poorly executed. “Automatic” is a fine example of a song with an interesting and even potentially poignant idea that nonetheless strikes out due to poor execution. Never thought about it until now but I get the third single rule. “White Liar” was fun, though. The lyrics to this song remind me of the many emails i get from fellow seniors lamenting the passing of the simple and wonderful past. They’re mainly a crock of …. I don’t mind those emails that merely ask if I remember these things. But, like Kevin said, don’t take away my power windows – or my Macbook, cellphone, etc. At any rate, there are parts of this song that I like, but I think Noah’s first comment perfectly spells out what makes me uneasy about the song, which is something that was nagging at me, but I couldn’t quite put my finger on it. Also, I still think “Famous in a Small Town” was a pretty clever single. First of all, Miranda Lambert will never be that kind of artist who wants to be loved by everyone. She never tries to be a vanilla and go with the flow kind of artist. That’s boring! Country music should be thankful for having Miranda as she continues to push bounderies. Honestly, I love “Automatic”. Judgemental song? I’m not even old but why do I love this song SO much? I am part of the YOUNGER generation and I firmly believe my generation should listen to this song to appreciate life better. Yes, I am same age bracket as Taylor Swift, Miley Cyrus, Justin Bieber, Selena Gomez, etc. but this song does NOT irritate me; telling us that we are spoiled brats because of all the advancements we have. I even took time and shared this song to my non-country friends and they like it! I believe, hate it or love it, after 20, 30 years or so, “Automatic” will be one of country’s best songs. You did it again, Ms. Miranda. I love “Automatic” because to me, it’s like a story book for a generation that never experienced that period of time. My grandmother told me it was a normal and moral thing for any girl to wait until marriage to sleep with a boy which she touch little bit of it. Miranda, you rock, can’t wait to your next one. Isn’t she a little too young to be reminiscing about some of this stuff? She was born in 1983 so her childhood was in the late 80s and 90s and she graduated high school in 2002. My biggest problem with the song is the production. The drums feel like they are trying to create an anthem affect and everything seems to be based around downbeats, which I feel like is becoming was too popular in country lately. Also, it just feels like this song is trying to be a power ballad even though it’s not. Miranda is only 30 years old that means she is not allowed to write about the good old days and make references from the 70s or what ever decade? But I still think she experienced all those references she made in her song. She’s from a small town down south, remember? Moreover, Miranda wrote this song with other writers FYI. I took into consideration where she grew up but it still seems she’s reminiscing about a time that she didn’t live in. As far as her co writers, Nicolle Galyon is younger than Miranda and Natalie Hemby doesn’t look any older than 30 either. This just reminds me too much of Bucky Covington singing about growing up in a time he didn’t grow up in. It comes off as unauthentic, just as it would if I reminisced about the days of black and white television since I grew up with color TV. She can make references to the ’70s or ’60s or any decade but it’s not authentic for her to wish to go back to her childhood in those decades since she was born in 1983. I know I’m late to the party (or hazing, whatever), but I think the line about “time” in the chorus sort of negates the philosophy of this review, as does the bridge, which I think is OSTENSIBLY about tech but really about the time it forced you to put in. And anyone can appreciate slowing down. I find GPS to be unreliable and boring. It is like the movie “Cars”. The movie struck a nerve with its message of slowing down and enjoying life which is a sharp contrast to our fast-paced lifestyle. The truth hurts.